Café, travel hub, photo gallery, movie theatre, new home of Vietnam in Focus… our Gallery and Café is Hanoi’s number 1 new destination for those looking for great coffee, fruit shakes or a cold beer and a place to chill amid the hectic streets of the Old Quarter. Enjoy the show as Hanoi’s street-life bustles past, and check out our stunning gallery of photographs taken by tour participants throughout Vietnam.We just moved in a few weeks ago, so the café is still a work in progress, but we aim to make it a unique and unmissable spot for both visitors to Vietnam and resident Hanoians. Alex and Colm are on hand in the mornings to offer travel advice and photography tips, and we have regular screenings of art-house movies in the evenings. Tours with Vietnam in Focus can also be booked here at any time. 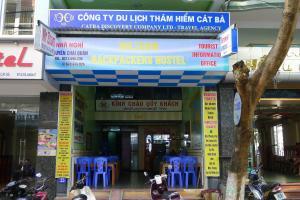 Featuring free WiFi throughout the property, Mr.ZOOM Backpacker Hostel offers accommodations in Cat Ba. Guests can enjoy the on-site restaurant.